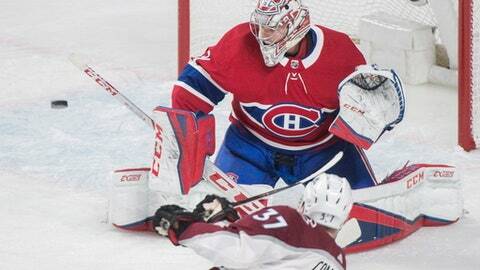 MONTREAL (AP) Jonathan Drouin had a goal and two assists, and the Montreal Canadiens ended Colorado’s 10-game winning streak Tuesday night with a 4-2 victory over the Avalanche. Nathan MacKinnon and J.T. Compher scored late in the third period for the Avalanche, who lost for the first time in 2018. Colorado’s previous defeat came against Arizona on Dec. 27. Jonathan Bernier stopped 36 shots but dropped to 0-7-2 in Montreal. The former Toronto Maple Leafs goalie is 1-10-3 vs. the Canadiens. Montreal outshot Colorado 40-22 and won for only the second time in six games. BOSTON (AP) – Brad Marchand had a goal and an assist, and Boston kept surging toward the All-Star break with a win over New Jersey. Miles Wood and Damon Severson scored for New Jersey, which has lost three straight in regulation for the first time this season. Cory Schneider made 17 saves in the first two periods and Ken Appleby stopped the only four shots he faced in the third for the slumping Devils, who are 2-6-3 in the last 11. NASHVILLE, Tenn. (AP) – Yanni Gourde scored 1:45 into overtime to give Tampa Bay a victory over Nashville. Chris Kunitz had a goal and two assists, and Vladislav Namestnikov and Steven Stamkos also scored as the NHL-leading Lightning won their second straight. Louis Domingue stopped 30 shots. Ryan Ellis, Viktor Arvidsson and P.K. Subban scored for the Predators, who had their five-game winning streak snapped. Juuse Saros finished with 27 saves. Stamkos tied the score 3-all on a slap shot from the left side with 2:12 remaining in regulation. DETROIT (AP) – Travis Konecny scored 27 seconds into overtime to lift Philadelphia over Detroit. The goal stood up after a video review, which determined Konecny was not offside when he got the puck near the blue line after Dylan Larkin lost it along the boards. Jakub Voracek scored a tiebreaking goal in the last minute of the second period and assisted on Andrew MacDonald’s goal late in the first for the Flyers. Brian Elliott stopped 19 shots. The Flyers have won four straight, for the second time this month, and 16 of 22 to surge into the playoff race. Jonathan Ericsson and Frans Nielsen scored for the Red Wings. Detroit has lost five of seven, pushing the franchise closer to missing the playoffs in consecutive season for the first time since a five-year drought from 1979-83. Petr Mrazek, coming off consecutive shutouts, made 28 saves. PITTSBURGH (AP) – Dominik Simon and Jean-Sebastien Dea scored 76 seconds apart in the second period, fellow rookie Casey DeSmith made 34 saves and Pittsburgh beat Carolina. Jake Guentzel added a goal midway through the third and Sidney Crosby extended the NHL’s longest active point streak to eight games for Pittsburgh, which has won six of eight. Derek Ryan had the goal for the Hurricanes, who have lost four of five and are 2-6-0 since beating the Penguins twice in a week spanning the New Year. ST. LOUIS (AP) – Carter Hutton made 25 saves for his 10th career shutout and St. Louis got goals from Vladimir Sobotka and Vladimir Tarasenko to beat struggling Ottawa. Brayden Schenn, who also had an assist, added an empty-net goal for his 20th of the season. The game was a bounce-back effort for Hutton, pulled after giving up three goals on 12 shots in Saturday’s 5-2 loss to Arizona. Hutton, normally the Blues’ backup, started for the fourth consecutive game and eighth in the last 10. He earned his second shutout this season. The loss was Ottawa’s fourth in a row overall. DALLAS (AP) – Alexander Radulov had two goals and an assist to lead Dallas past Florida in a penalty-filled game. Devin Shore had a goal and an assist, and Jamie Benn, Mattias Janmark and Tykler Pitlick also scored for the Stars, who improved to 4-0-1 in their last five games. Ben Bishop made 33 saves. Aaron Ekblad scored for the Panthers, and rookie Harri Sateri had 30 saves after James Reimer was injured 3:48 into the game. Radulov and Benn extended their point streaks to eight games. They each have 20 goals this season. EDMONTON, Alberta (AP) – Jack Eichel had a goal and three assists, Ryan O’Reilly scored twice and Buffalo earned an easy win over Edmonton. Sam Reinhart had a goal and two assists and Zemgus Girgensons also scored for the last-place Sabres, who won their second game in a row for just the second time this season. The other time was in late October. Robin Lehner made 33 saves for his second shutout of the season. Cam Talbot stopped 18 of 22 shots before Al Montoya relieved for the Oilers, who had a three-game winning streak snapped. It was the sixth time this season Edmonton has been shut out. LAS VEGAS (AP) – William Karlsson scored two goals against his former team, Marc-Andre Fleury stopped 29 shots and Vegas beat Columbus. Brad Hunt, Colin Miller, James Neal and Erik Haula also scored for the Golden Knights, while Jonathan Marchessault added two assists. With the win, the Pacific Division leaders stayed right behind NHL-best Tampa Bay, which defeated Nashville 4-3 in overtime. The Lightning have 69 points to top the overall standings, and expansion Vegas is second with 68. The Blue Jackets, playing for just the second time in 12 days, got goals from Markus Nutivaara, Josh Anderson and Matt Calvert. Sergei Bobrovsky made 32 saves. Karlsson was selected from the Blue Jackets during the expansion draft last June. ANAHEIM, Calif. (AP) – Andrew Cogliano and Adam Henrique capped Anaheim’s four-goal first period against slumping New York. Ryan Getzlaf had a goal and an assist, Corey Perry added a goal and an assist, and Rickard Rakell and J.T. Brown also scored to help the Ducks win for the fourth time in six games. John Gibson stopped 41 shots. Rick Nash had two goals, and Michael Grabner also scored for the Rangers, losers of six of their last eight. New York goalie Henrik Lundqvist was pulled after giving up three goals on seven shots over the first 16:21, after Cogliano scored the tiebreaking goal. SAN JOSE, Calif. (AP) – Bryan Little scored his second goal of the game 18 seconds into overtime, lifting Winnipeg over San Jose. Joel Armia also scored twice and Mathieu Perreault had a goal to help the Jets win their third straight and fifth in the last seven. Connor Hellebuyck finished with 29 saves. Joe Pavelski, Logan Couture, Chris Tierney and Timo Meier scored for the Sharks, who lost for the second time in seven games. Aaron Dell had 18 saves. VANCOUVER, British Columbia (AP) – Loui Eriksson led Vancouver’s early outburst with two goals and an assist in the first six minutes, Brock Boeser scored twice in the second period and the Canucks cruised past Los Angeles. Thomas Vanek, with a goal and two assists, and Sven Baertschi provided the rest of the offense for Vancouver, which got 30 saves from Jacob Markstrom. Bo Horvat and Alexander Edler each added two assists for the Canucks, who were playing at home for the first time in three weeks. Anze Kopitar had a goal and an assist, and Alex Iafallo also scored for the Kings. Jonathan Quick allowed five goals on 19 shots, including four on 11 attempts in the first 9:58. Darcy Kuemper relieved Quick with the score 5-1 early in the second.